The ProShares UltraShort QQQ (QID) tracks the double inverse or -200% performance of the Nasdaq 100. It has been tracking lower as the Nasdaq has been attempting to make new highs. 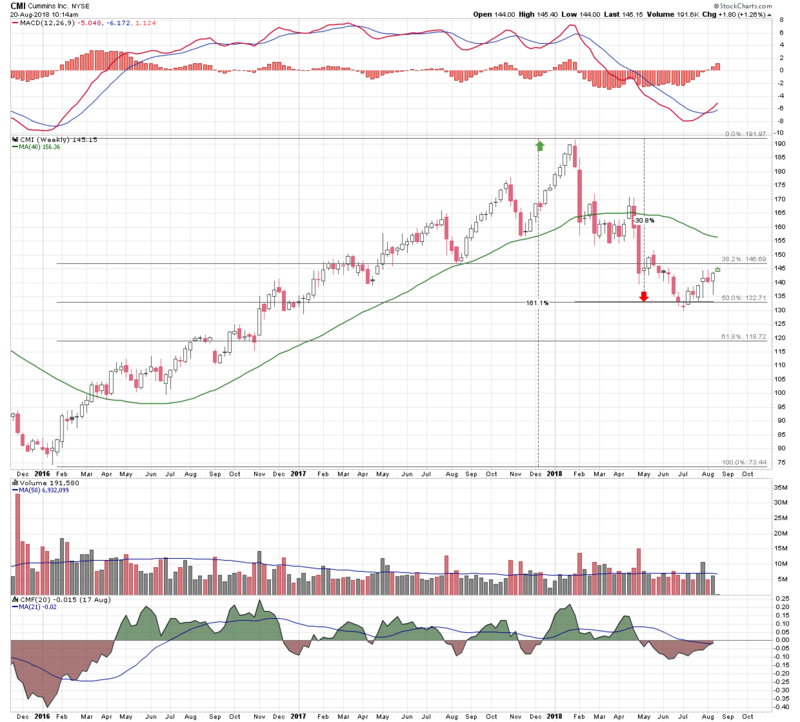 While the QID has been making lower highs it has not been making lower lows. A short-term base has developed around the $37 level, and the combination has formed a descending triangle pattern on the daily chart. The moving average convergence/divergence indicator (MacD) has been in bullish divergence to the fund price for the last two months. 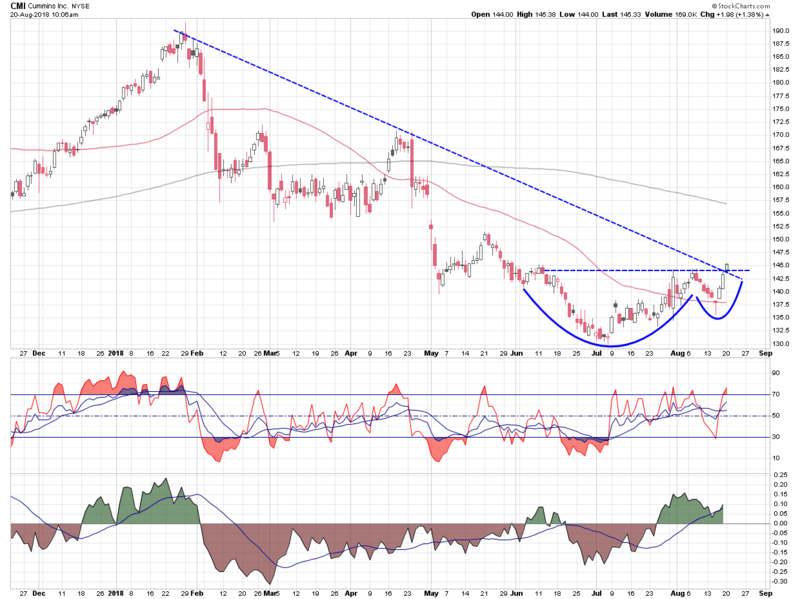 This is an indication of underlying upside momentum. Money flow is still in negative territory but is tracking higher reflecting waning downside price pressure. If the QID were to bounce off its $37 base and break above the downtrend line, the triangle pattern’s measured upside move targets the $44 area. This would also intersect with the declining 200 day moving average. There is an inherent risk associated with trading any multiple inverse fund, but there is also the potential for added reward. 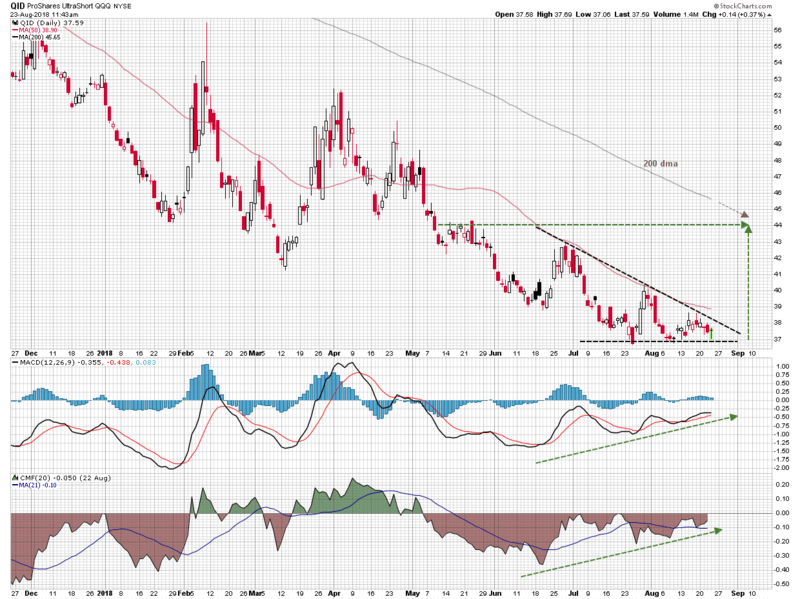 So, a good risk/reward scenario represents opportunity. The nearby levels of current resistance (entry point) and support (stop loss level) on the daily QID chart, define a low risk/reward set-up. It should be understood that this would be a highly speculative and potentially volatile trade. It requires a clear and disciplined trading plan. Remember that preservation of capital is job one. The major stock market indices have moved back up to challenge their all-time highs. 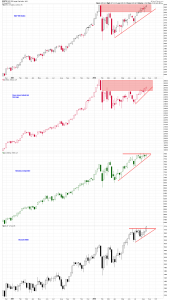 The Russell 2000 Small Cap Index broke out to new highs today, piercing through the upper end of a rising triangle pattern and closing near its highs of the session. 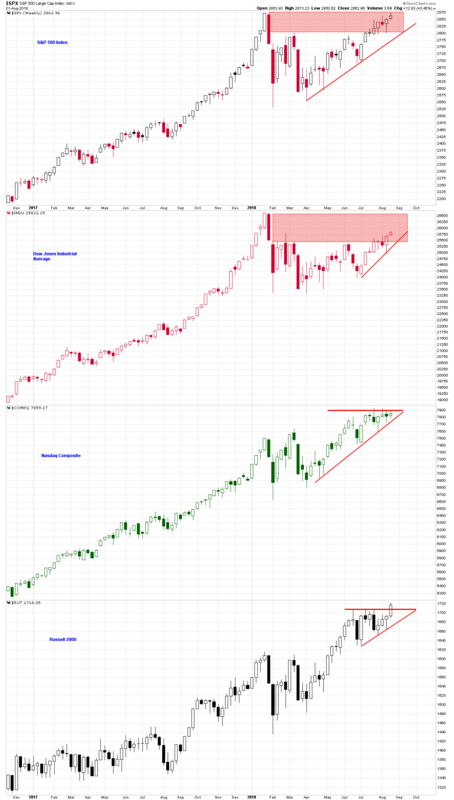 The S&P 500 index and the Nasdaq Composite are right at or approaching their former highs, but the Dow Jones Industrials, the early leader in this recent phase of the longer term rally, still has some work to do. On close observation though the S&P chart is a bit concerning, at least for the short term. 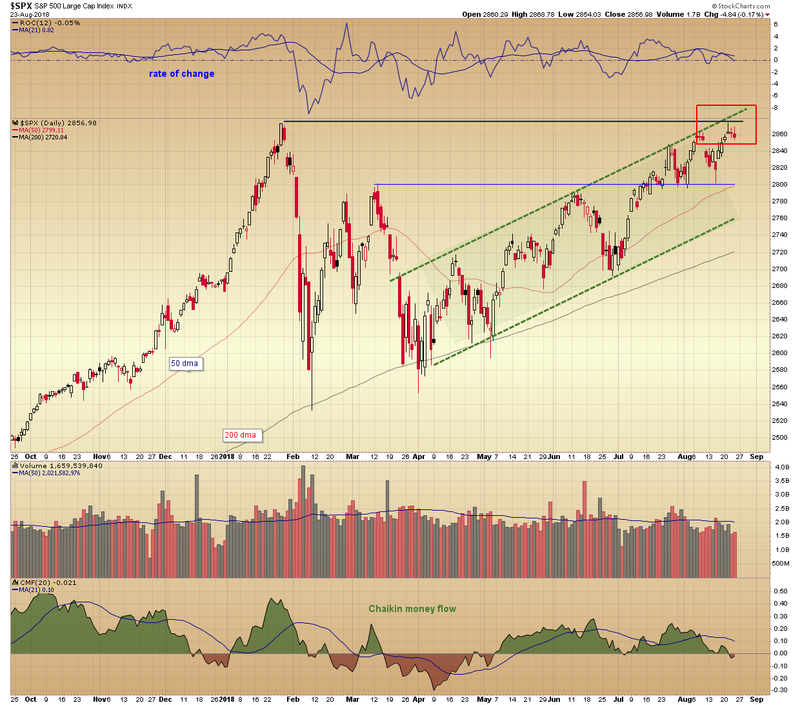 The daily chart shows the index moving higher since early April, within the confines of a rising channel pattern. It successfully retested the March 2800 high level several times, and then continued on to its seemingly appointed meeting with its January 2018 high. 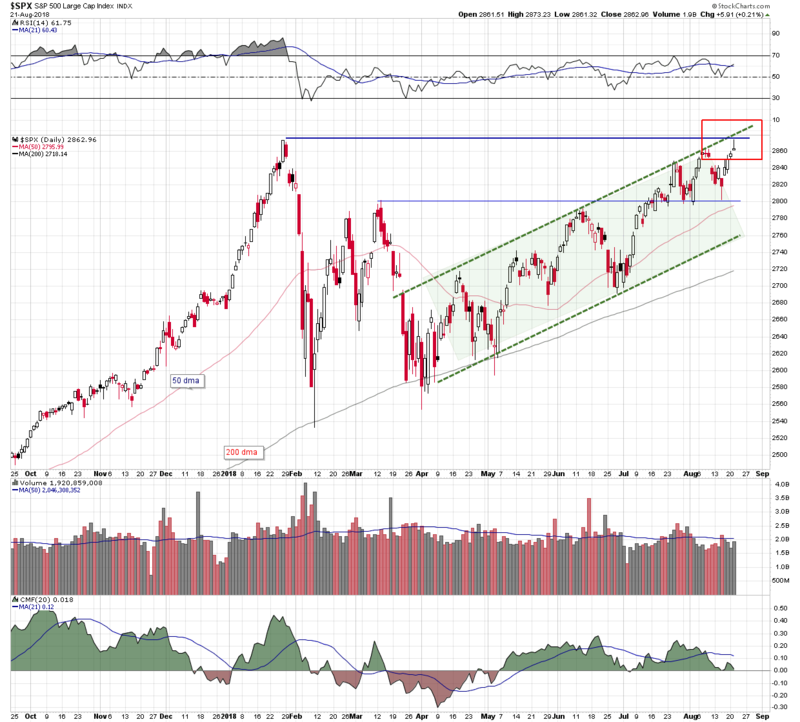 That January 2018 all-time high level is currently intersecting with the four month rising channel resistance line. Today it was tested and the S&P backed off, forming a gravestone-like doji candle on the chart. A gravestone doji is a candle with a narrow opening and closing range situated at the bottom of its overall range. It reflects a failure to hold its higher level and is sometimes seen at tops. It would be ludicrous to infer from one-day of suspect price action that a market top is in place. But it may not be as easy as some think to penetrate and, more importantly, sustain these new high levels. It could take several failed attempts. Take another look at the block of index charts and note how close the support lines are to their current prices. If there were multiple failed attempts to breakout and one of the resulting pullbacks took the S&P or one of the other indices (including the Russell), back through its nearby support level, the technical picture would take a bearish turn. 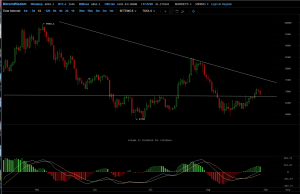 Just a reminder that a successful breakout requires confirmation. Generally, it needs several days of upside action or a successful retest of the breakout resistance-turned-support line. Trust but verify. 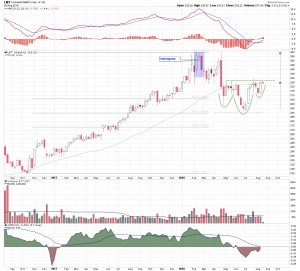 An inverse head and shoulders pattern has formed on the weekly Lockheed Martin (LMT) chart, and shares are testing neckline resistance. A breakout could power a return to the highs made earlier in the year. In 2017 LMT saw a 60% increase in its share price, making a high in February of this year. But the highs in February were part of a large bearish eveningstar pattern on the weekly chart that initiated a reversal in the stock price. An eveningstar formation is made up of a large white candle, followed by a narrow opening and closing range doji candle, and completed by a large dark candle. It represents a transition in sentiment from bullishness to bearishness and is often seen at important tops. Following the eveningstar there was one final attempt to make a new high in April but then Lockheed shares moved back below their 40 week (~200 day) moving average. They eventually retraced 50% of their 2017 gain. 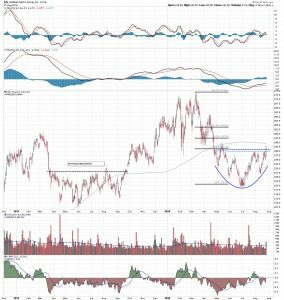 The subsequent bottoming process just above the 50% retracement level at $290 has developed into an inverse head and shoulders pattern. 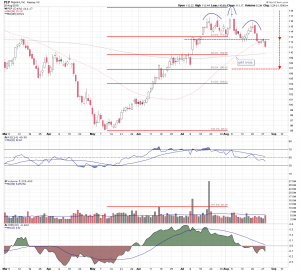 Neckline resistance is located at $327.50 and is being reinforced by the 40 week average. Moving average convergence/divergence has made a bullish crossover reflecting positive short term price momentum and trend direction. Chaikin money flow has been moving higher since the inverse head low was made in July, and is attempting to enter positive territory. This suggests early buying interest in the stock. 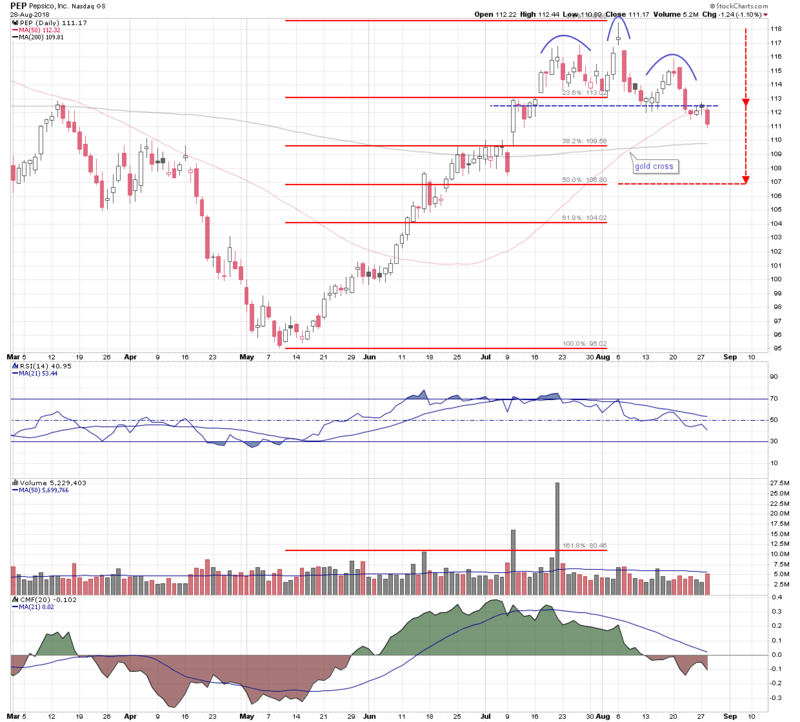 Lockheed shares are currently retesting the neckline of the inverse head and shoulders formation. If they were to break through that resistance, the pattern’s measured move, which is calculated by taking the height of the pattern and adding it to the neckline, targets the old highs made at the beginning of the year. 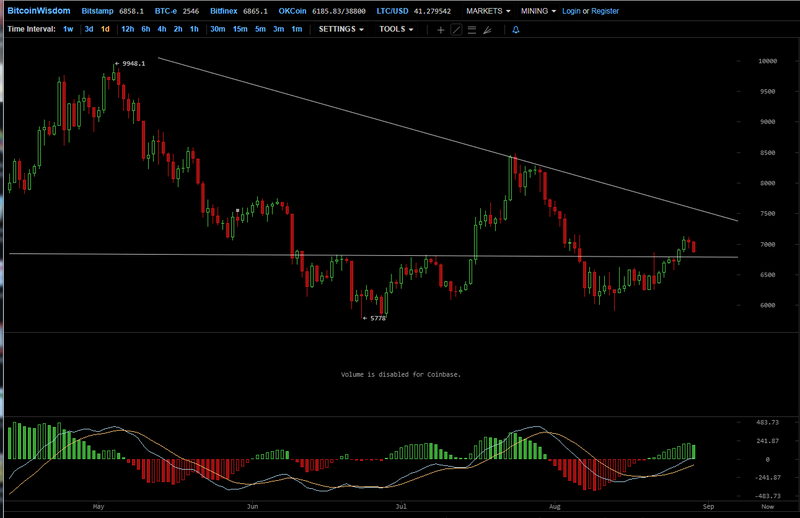 This would constitute a 10% move which would return them to the $360 area. Cummins (CMI) rallied over 160% from early 2016 to early 2018. 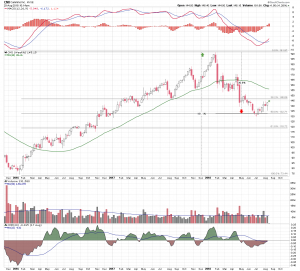 Then it quickly reversed course and began a seven month decline that saw it retrace 50% of its rally range. It bounced off that 50% retracement level this month situated at the $132 level and moved back up to the 38% retracement level. 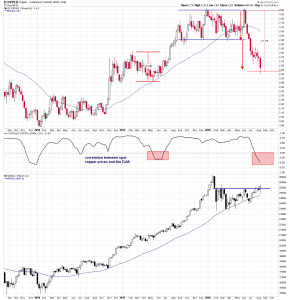 On the weekly chart the MacD can be seen making a bullish crossover and Chaikin money flow is moving into positive territory. These indications reflect positive price momentum and money flow. 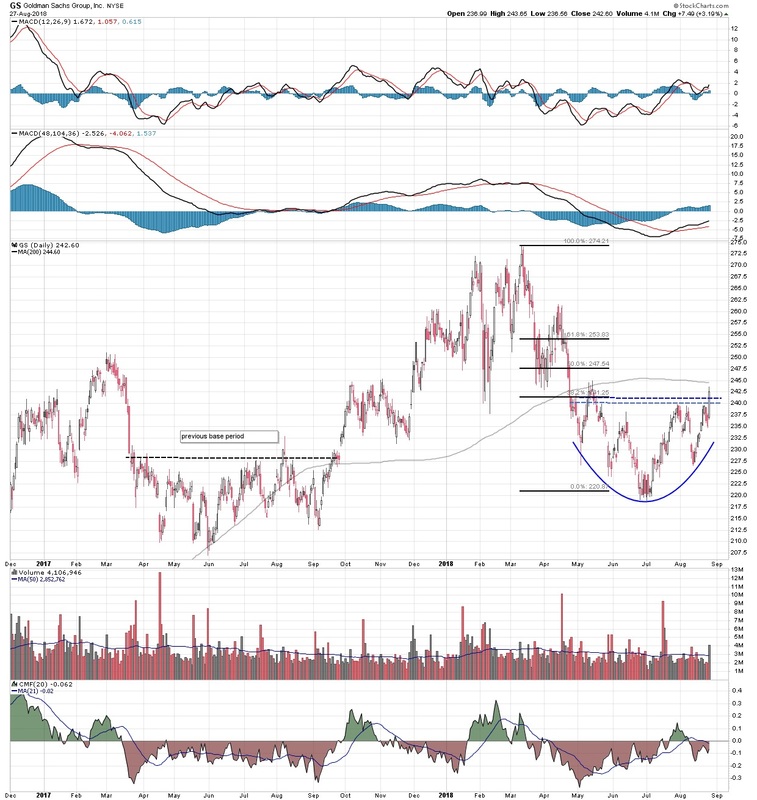 Cummins has been basing on the daily chart above $132 in what has developed into a cup and handle pattern, with rim line resistance in the $143.50 area. The relative strength index on this time frame is tracking higher and the Chaikin money flow indicator suggests the stock is under accumulation. 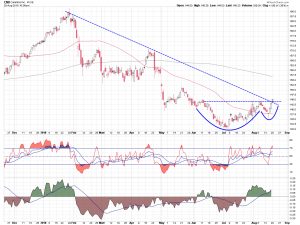 Today the stock price is breaking above the intersection of resistance defined by the cup and handle rim line and the downtrend line drawn off the highs of the year. 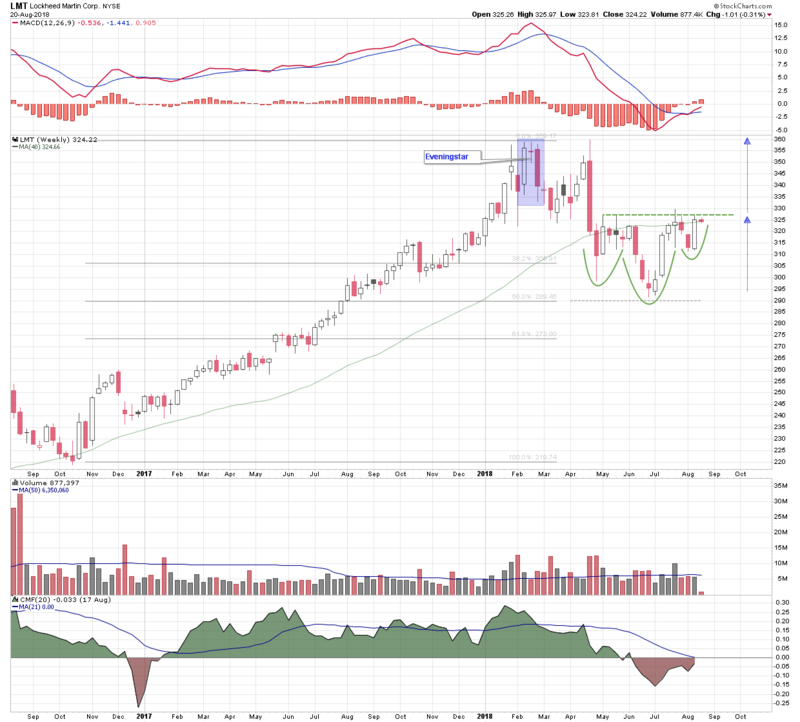 The pattern projects an upside price objective measured by taking the depth of the cup and adding it to the rim. It target’s a return to the 200 day moving average which is currently located in the $156 area. The movement in the price of spot copper and the movement in the Dow Jones Industrial Average (DJIA) are very highly correlated. That means they generally move higher or lower in tandem. There are, however, periods of divergence and those periods can provide a trading edge. When a stock is moving higher but the MacD indicator, for example, on the chart starts to move lower that is a bearish divergence. The stock would be expected to follow the indicator lower. 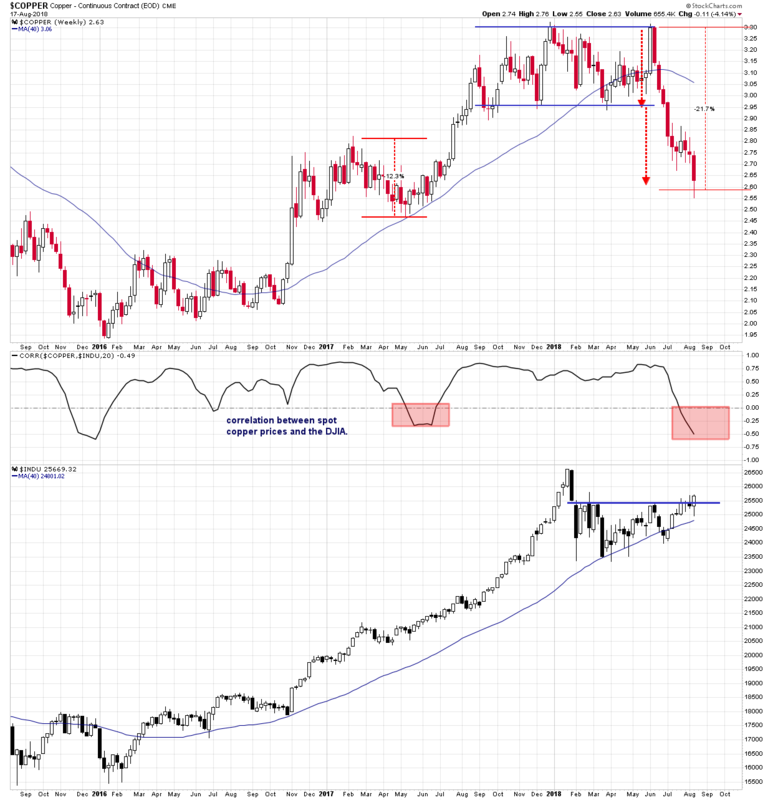 Conversely, when a stock is making lower lows but, let’s say the RSI is making higher lows, this would be an example of a bullish divergence. The stock would be expected to catch up with the indicator. Copper has been selling off since June this year after it broke the support line of a large horizontal triangle. The stock index has been consolidating under 25500, but making higher lows above a rising 40 week (~200 day) moving average. So, copper prices have been moving sharply lower since June, while the industrial index has been making incremental higher lows. This is a divergence between a normally correlated pair. During this time the correlation coefficient, which tracks the relationship between the metal and the industrials, has moved below its center line. This is a reflection of the disconnect between the two. This week the DJIA broke above the 25500 level and closed on its high, forming a bullish hammer candle on the chart. Spot copper managed to move off its weekly low at $2.55, and close slightly higher. 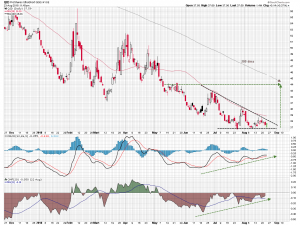 The $2.60 area for copper is the downside measured move of the large horizontal channel pattern breakdown. It is also the 50% retracement level of the 2016 low in copper and this year’s high. It would be a logical place for a bounce in the metal and a bounce in copper would likely fuel additional upside in the industrial sector. 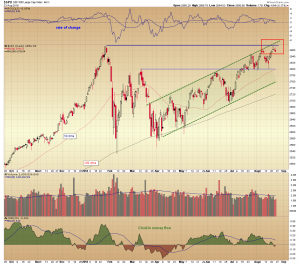 Continued strength in the DJIA will take it closer to new highs and that in itself could provide further upside potential. If copper starts to bounce off it recen lows, it could see even more rapid upside as the spot price reverts towards a more normalized correlation with the Dow. Bottom line: copper should outperform in an environment of continued industrial strength.